This cello belongs to the great Philadelphia cellist Lorne Munroe. 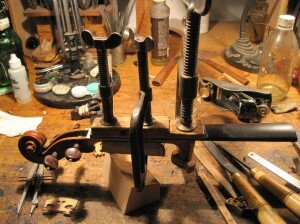 It was made for him by Thomas Elmer in Philadelphia in 1960. Unfortunately it suffered a fall and the neck pulled out at the button and to make things more difficult the piece of the back known as the button – which is glued to the neck- has separated at the purfling and stayed attached to the neck stock. In order to do this repair properly the back must come off and the button must be carefully removed from the neck and reglued to the back. 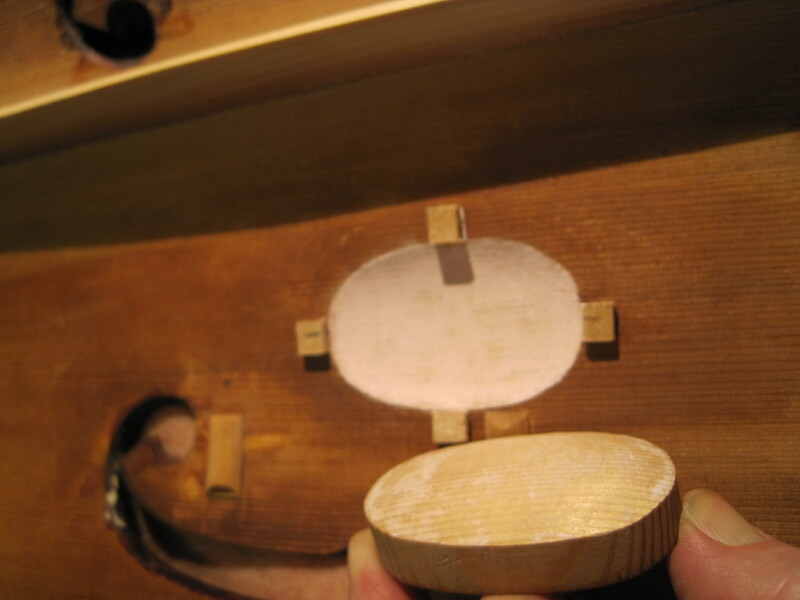 Then the break will be discretely reinforced with new wood spanning the break.The back then is glued back on and the button area is ready for varnish touch up that will make the break invisible – which should make you think twice and look very close when buying an old instrument! 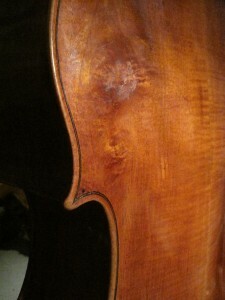 Lastly, the neck is reset, the varnish is restored and to the untrained eye nothing has happened. 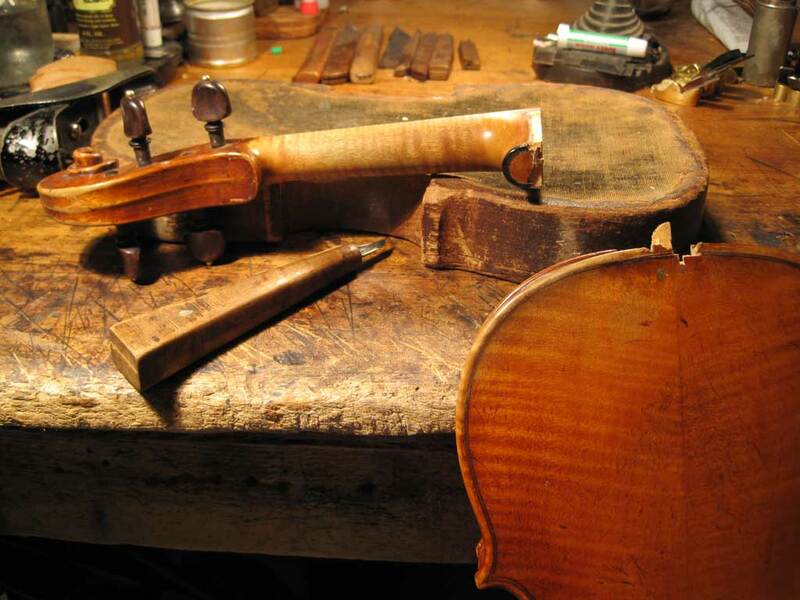 They may be good at moving people inexpensively, but they are certainly not to be trusted with fine musical instruments. 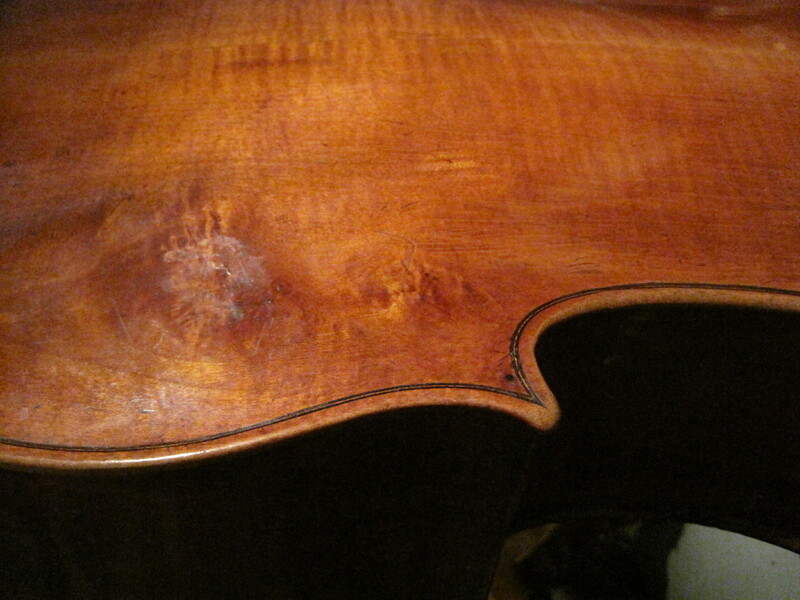 This fine, early 19th century German cello was in a very sturdy shipping case when it must have been dealt a stunning blow. 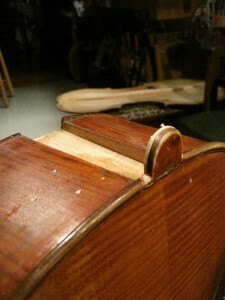 Luckily the damage was mostly confined to where the old neck graft joined the scroll. 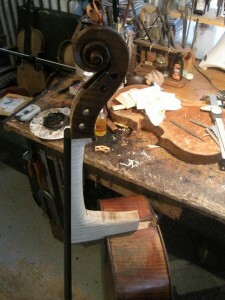 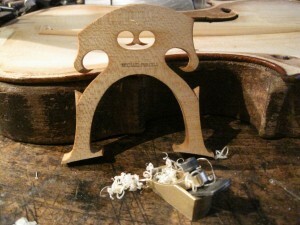 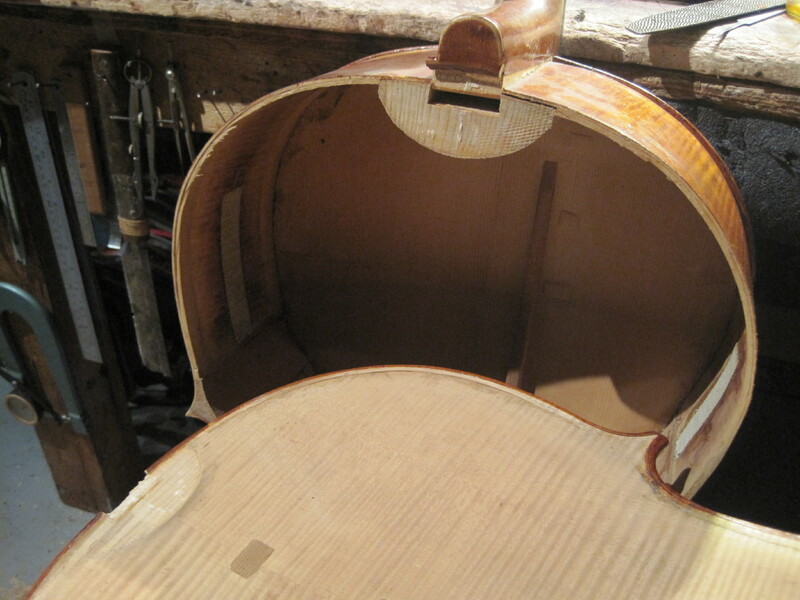 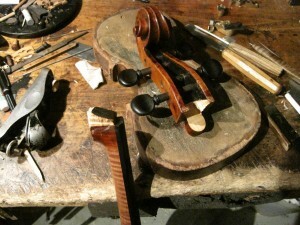 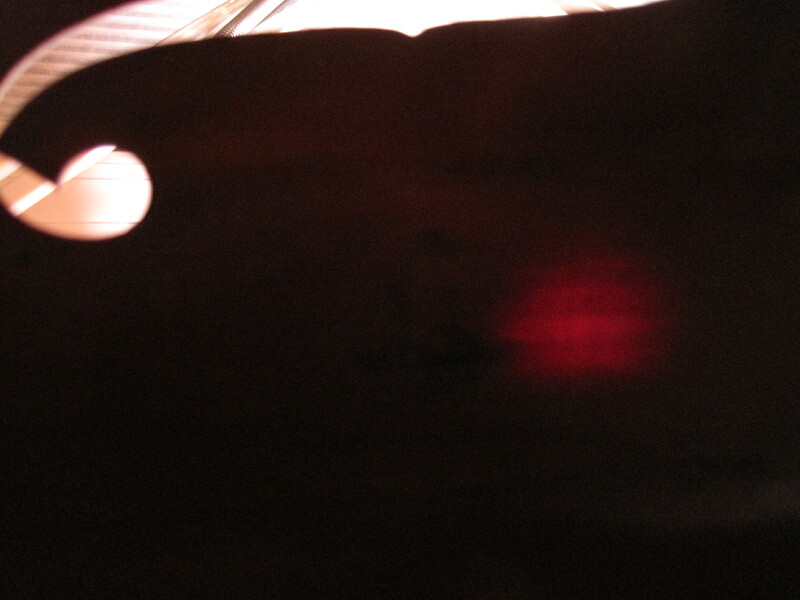 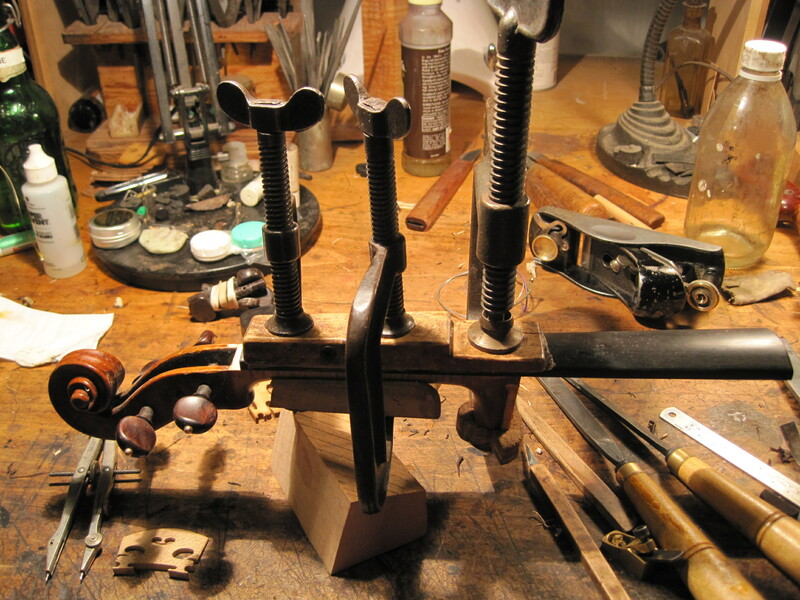 The new graft will carefully clean up all the ragged wood and restore the cello to its previous fine state and value. 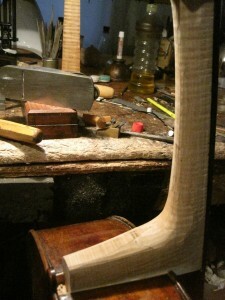 First the scroll needs to be cleaned up , with the sides of the pegbox flattened and prepared to accept the new neck. 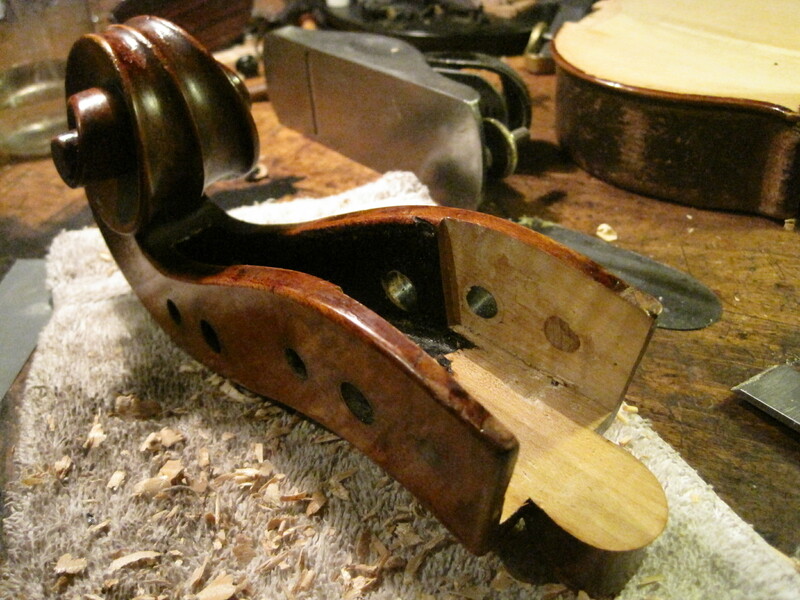 Next is the tricky job of getting the old neck out of the body. 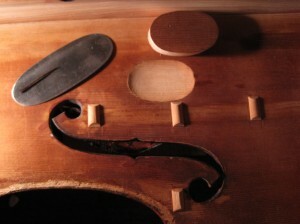 You carefully(!) 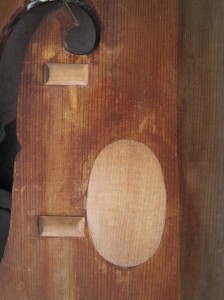 make a saw cut just inside the button and work an opening knife along the joint where the neck stock joins the ribs. 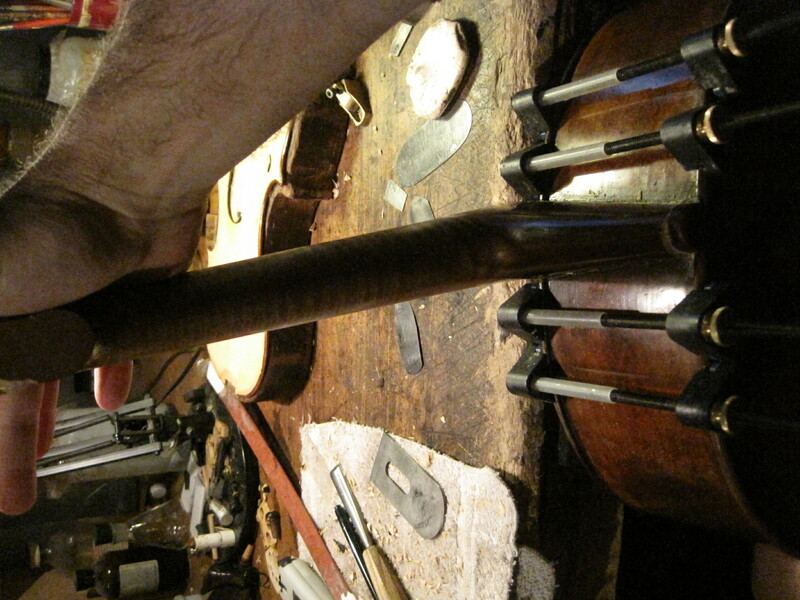 When you have loosened the neck all around you put clamps on the ribs adjacent to the neck – then the bold part of giving the neck a swift shot to one side. 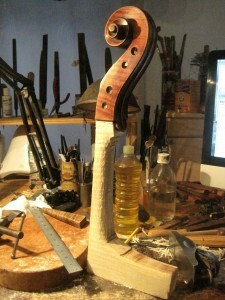 This will release the joint underneath the neck stock – but not without a dramatic (and heart stopping) thwack. 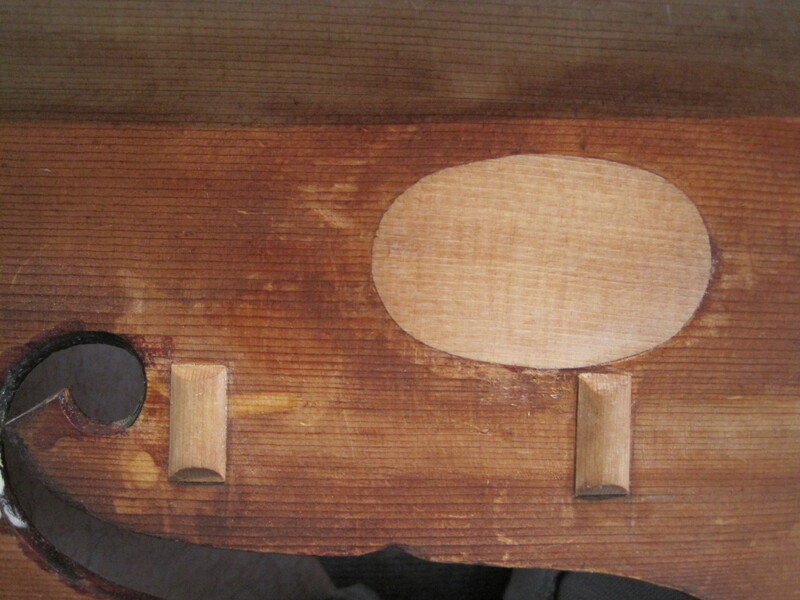 This is the glue letting go of the joint between the end grain of the neck (which really is not a very strong joint) and the mortise of the top block. 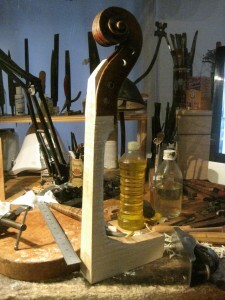 Now its time to prepare the mortise and fashion a new neck. 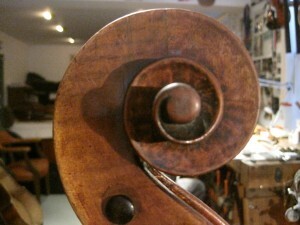 A beautiful cello owned by the famed Guildhall School in London was in my studio recently for some extensive gluing and a new bridge. 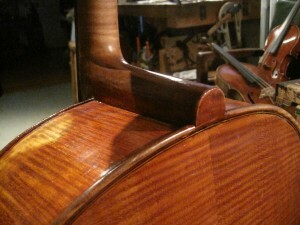 We decided on a Belgian bridge for its ability to give a cello more punch and bold clarity of sound. 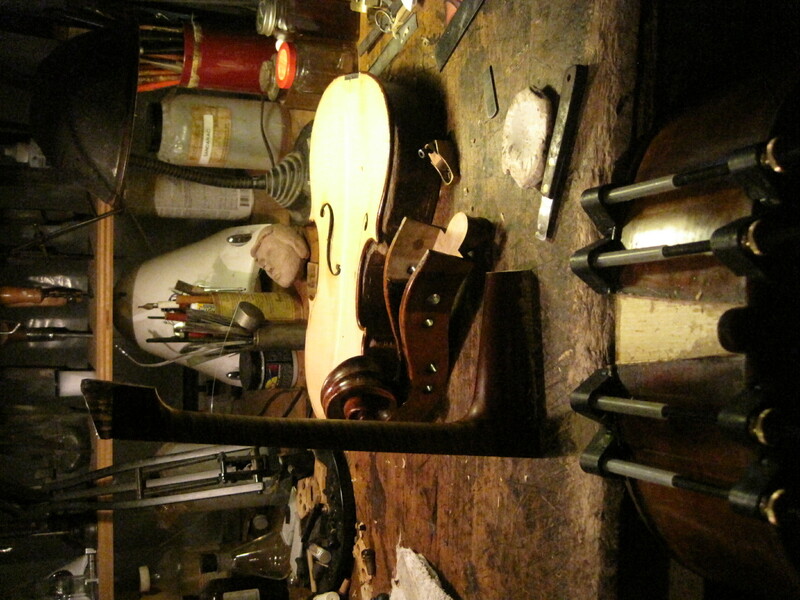 With its higher legs and compressed torso the bridge gets to the height it needs to be with less wood than the traditional French bridge blank so there is less material in the way as the bridge transmits the sound from strings to body. The sculptor in me loves cutting these blanks with their graceful leg curves and jaunty, military bearing. 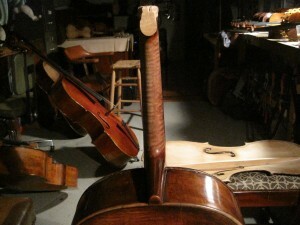 The cello itself is a treat to behold with its rugged sculptural power, bold craftsmanship and subtle, artistic details. 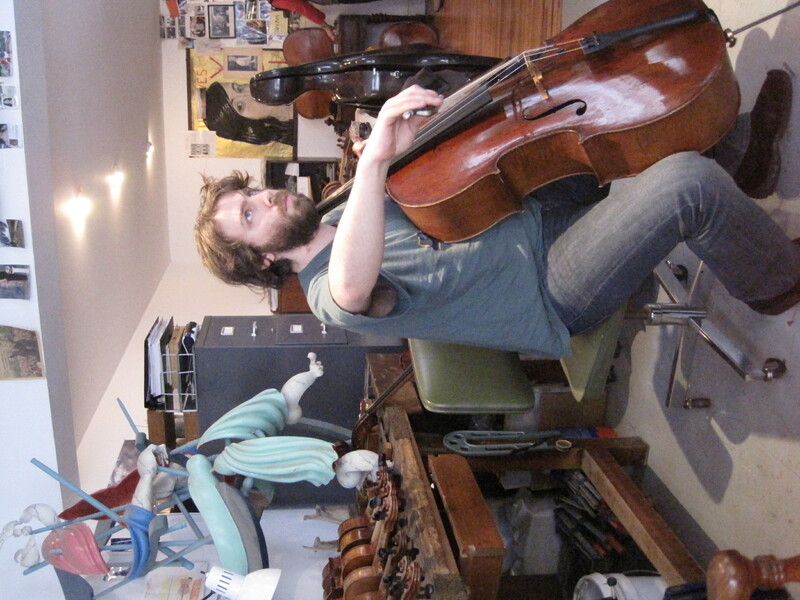 Bart Lafollette , the promising young cellist who has had the use of this cello treats me to a Bach suite while trying out the “new” cello – He claims it has never sounded better – high praise from him and the fact that the cello has spent time in the finest shops in London. 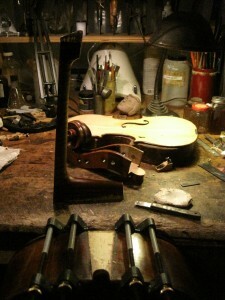 Bart will be recording with the Doric Quartet in London and playing solo gigs in England and on the continent. 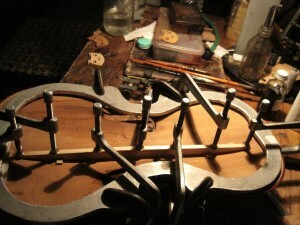 Its great to be able to help him fill the hall with his great musicality. 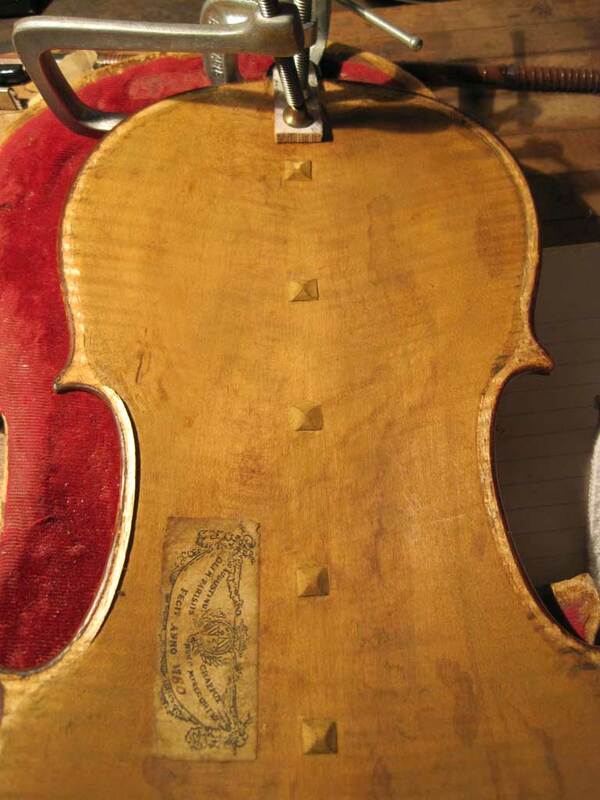 The neck has come violently out of the body of this nice, old French violin due to a fall. 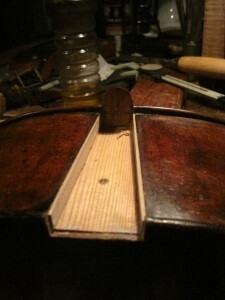 The back will have to come off ,the button re-glued and then patched. 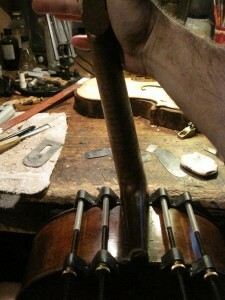 Then the neck will be reset. 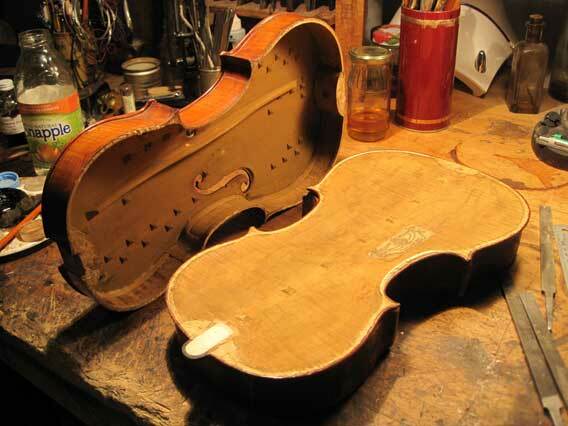 It will no doubt re-emerge as a fine violin. 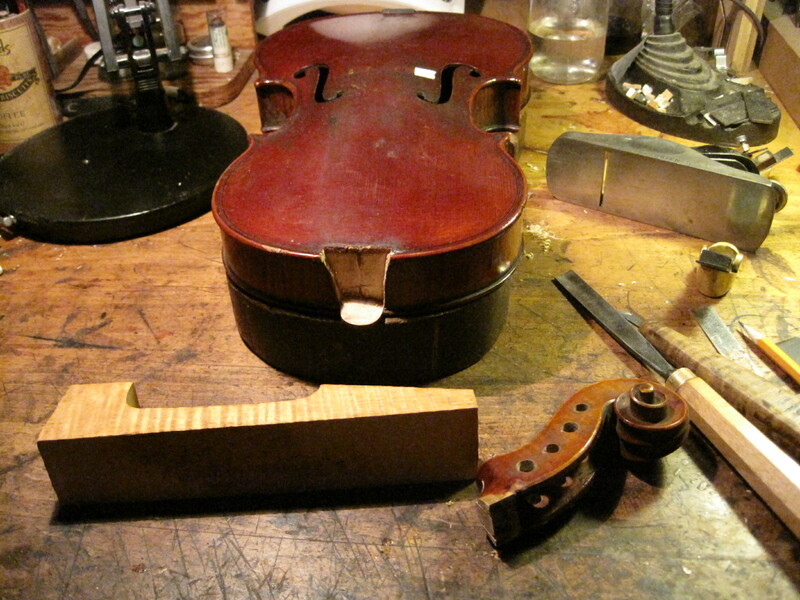 Hopefully there will be no trace of the damage- except maybe to the trained eye. 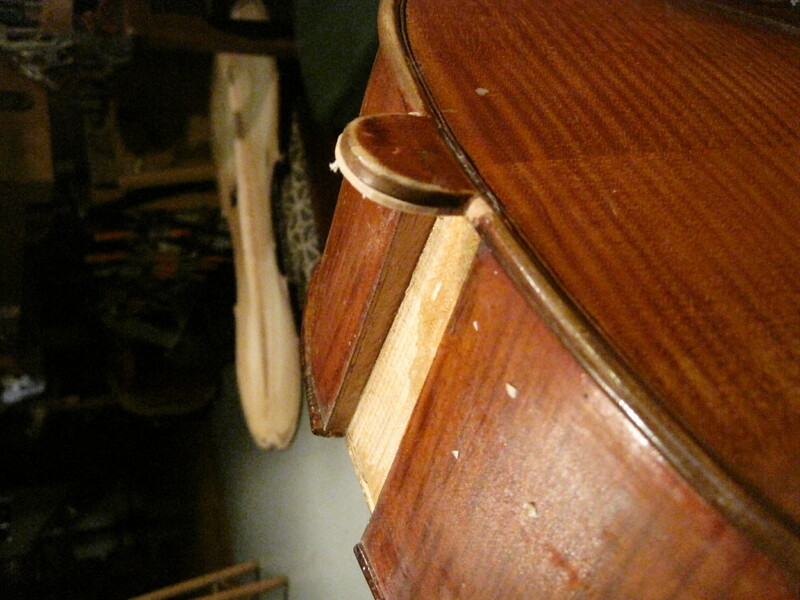 The back has now been taken off and the broken button re-glued to the back(it was still attached to the neck stock from the neck coming out suddenly). Then a patch is fit spanning the break to strengthen the area to hold the tension on the neck set. 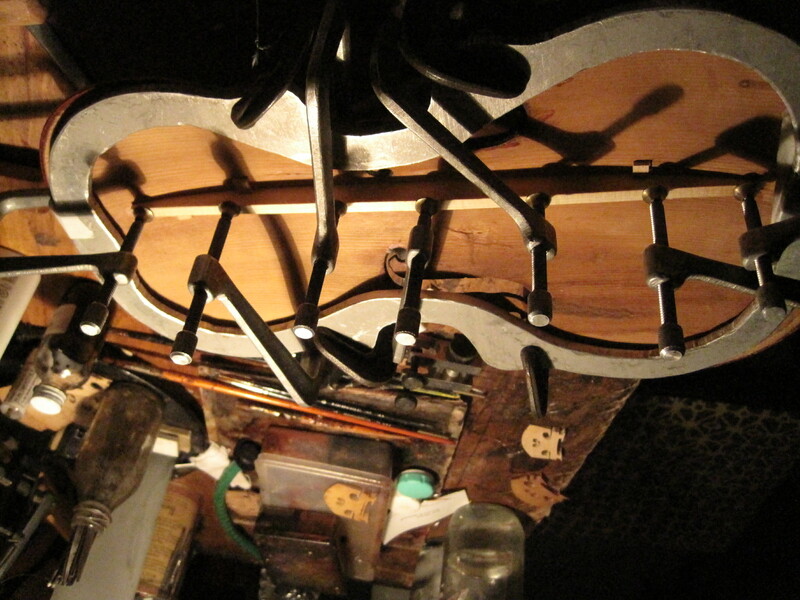 This patch will be hidden by the ebony ring on the neck stock. 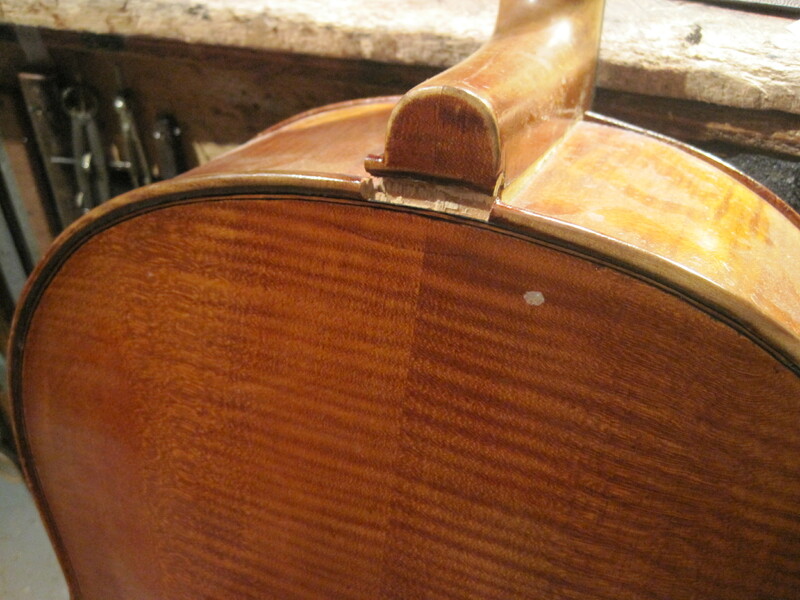 This fine cello sustained a fall where the neck sheared off. 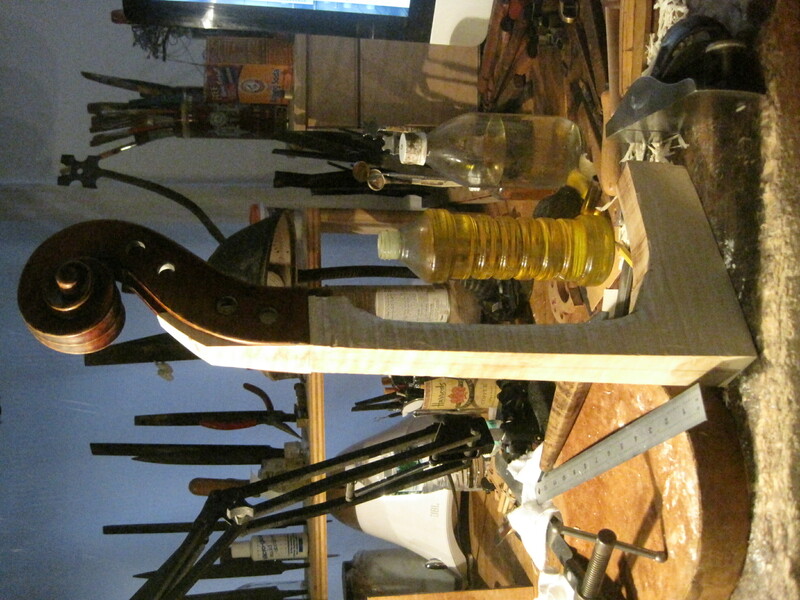 At this point in the process the old neck has been cut away ,the pegbox has been beveled to a flat thin edge and a new neck has been roughed out and glued into the pegbox. 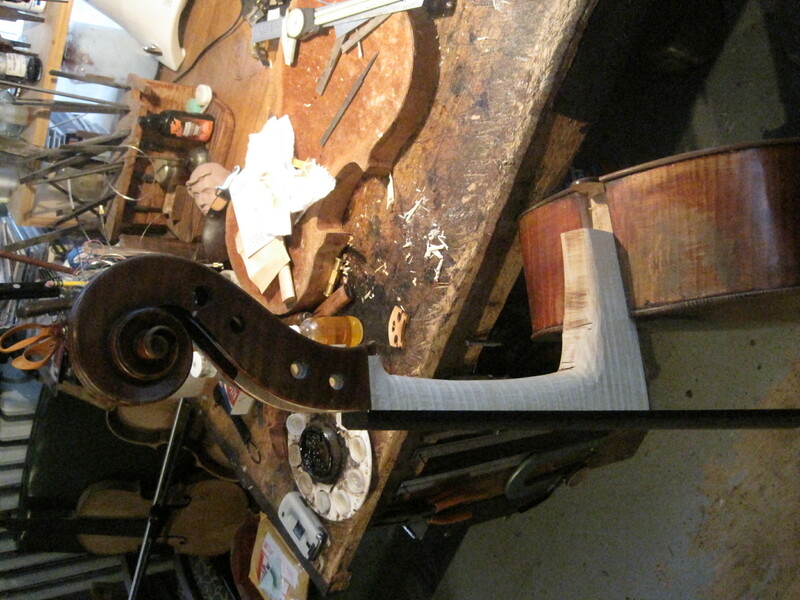 At this point I’ll begin to set the neck – and get it ready to play a piece by Dutilleux by a player in the Philadelphia Orchestra. 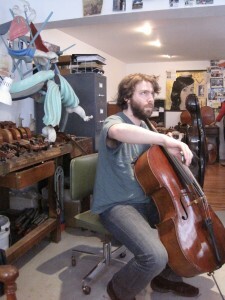 One of the movements is just the cello section so it better be there! 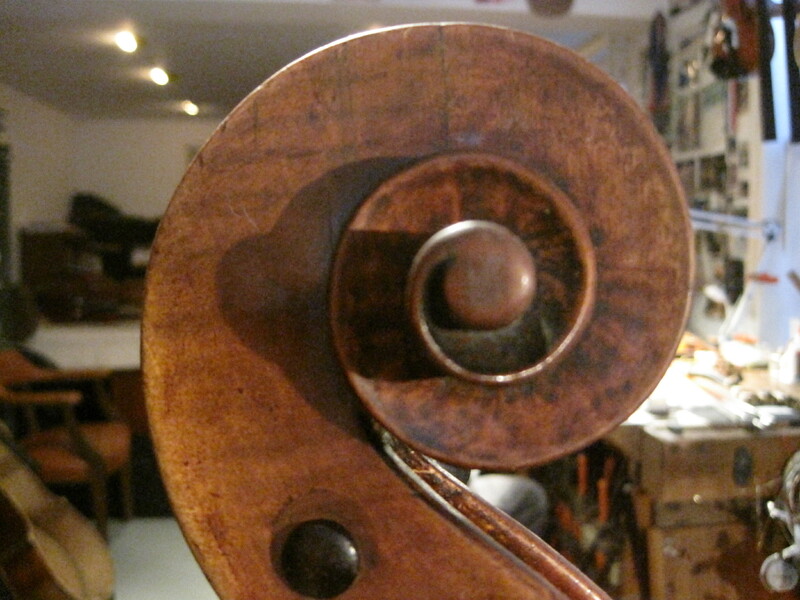 A beautiful,small English viola c. 1800 by William Forster. 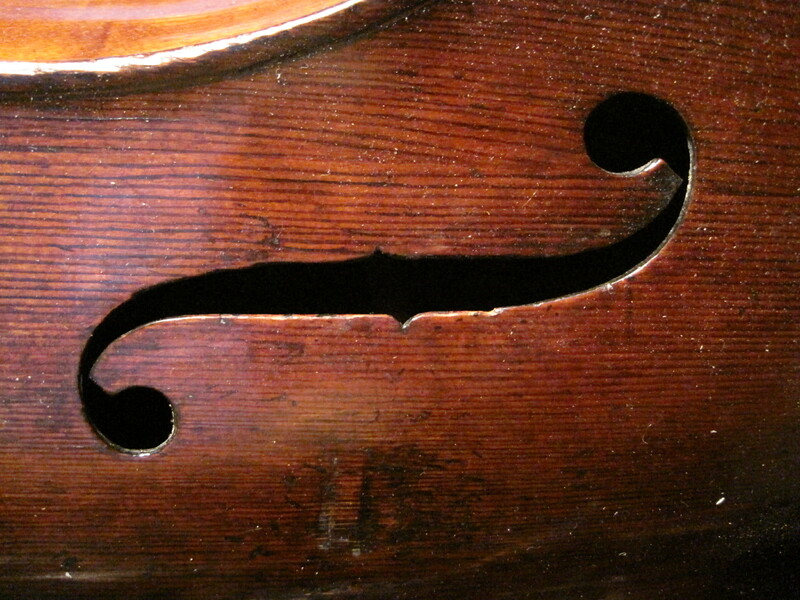 The bass bar is crucial to the lower registers resonance. 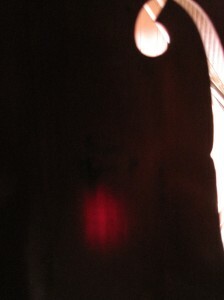 It has two functions. 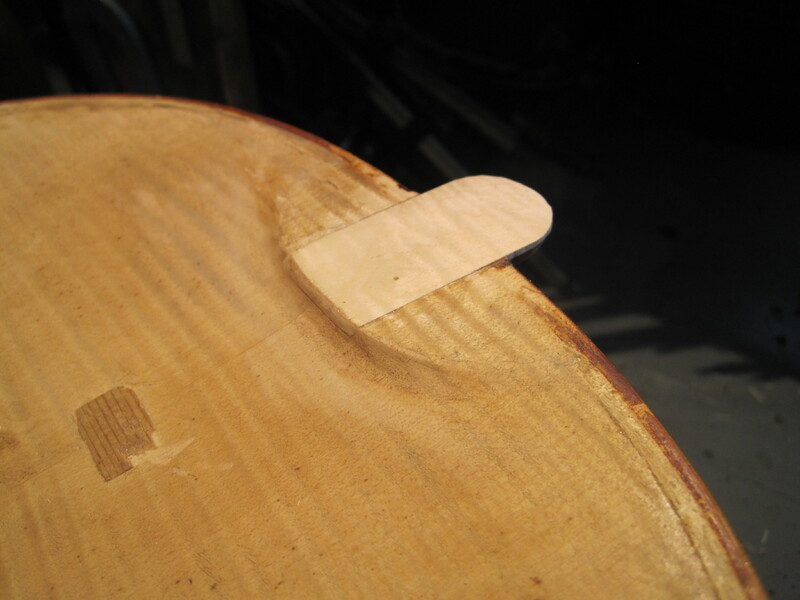 It helps support the top against downward string tension exerted through the bridge .It also acts as a conduit through which the vibrations are spread out over the whole spruce top. 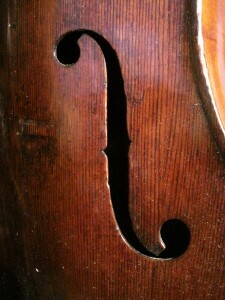 The soft spruce of the top flexes widely giving the lower register its “growl”. 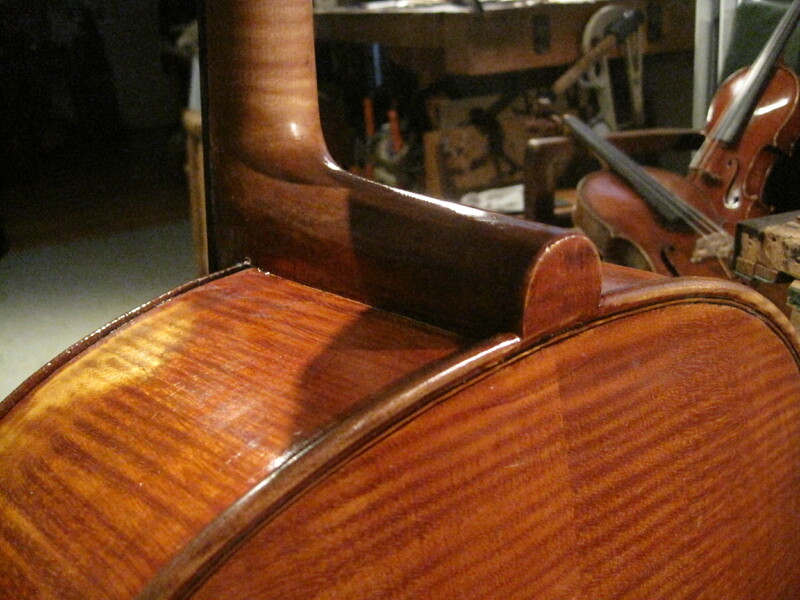 This viola is a higher arched model which means the bar can and should be slighter since the higher arching needs less support. 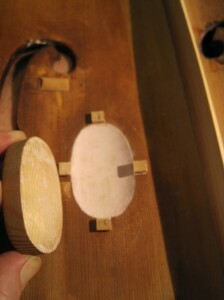 Few bars are correct in terms of placement and heft. 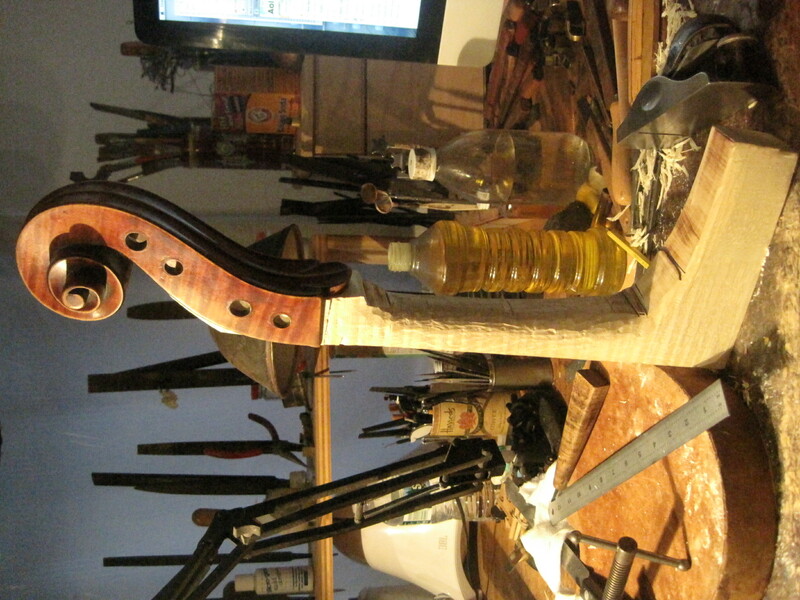 I make sure all my instruments have a proper bass bar.